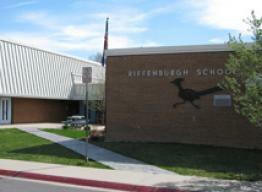 Riffenburgh Elementary School, which opened in 1968, was named for Waldo Riffenburgh, former president of the PSD Board of Education. Riffenburgh Elementary is an International Baccalaureate (IB) Primary Years School, providing concept-based, trans-disciplinary units and an inquiry-based approach to learning. Riffenburgh’s school-wide character education program teaches students social skills to make safe, responsible choices. Rigorous standards in math and literacy, using PSD’s standards based curriculum, are emphasized and assessed. Gifted and talented, reading services, as well as special education resources, speech/language, and O/T programs are also offered to address the individual needs of each student. Enrichment activities include Odyssey of the Mind, the Rockin’ Roadrunner Choir, Little Kids Rock Band, student council, accelerated reading, running and chess clubs, Spanish enrichment classes, character education, active fieldwork and research through our National Science Foundation grant, and Missoula Children’s Theatre.